Two upsets in the three marquee National Championship Eights races - college racing can't really end on a much higher note than that. The California Men's Varsity eight got their second 1000 right when it counted to claim the IRA title over a heavily favored Washington crew, while the Stanford lightweight women won their first national title in the Women's lightweight Eight today. Princeton's win and national title in the Men's Lightweight eight wasn't an entirely safe bet today, rubber match with Harvard that it was, and even that outcome stayed in doubt throughout the race, emblematic of a great day's worth of finals racing. These may go down as some of the faster IRA races in recent memory; a consistent, light to medium tailwind on all three days of racing definitely helped, and a screaming tail for the finals today helped crews improve 4 course records on the day. The Cal Bears peaked on the day, and got the race of the year when it counted, rowing down what had been an utterly dominant UW Varsity in the last 5 strokes to get their bow across the line first. "All of the things were aligned today," said Cal's Mike Teti after the race. "We had a good tailwind, we had a good lane, and as a coach you always hope it plays out that way, and sometimes it does. I told them before the race that if they rowed the way they did in practice, then they could win. I wanted them to understand that they were up against a tough, seasoned, well-coached crew, and it was going to have be their best performance. We have a big rivalry with them, and there's a lot of hype, and I want them to understand that it can't be about the hype, they have to execute and have their best race today." On the work they'd done since Pac-10s, Teti said it was straightforward. "We have improved a lot. We have a measured course, we knew we had more speed, and obviously you have do it on the day. That's why we tried to really go for it in the semi, because I felt like if we lost to Washington by 4 seconds again, it would be like that was the way it was supposed to be. When we got a little closer, we felt that with a better race, we maybe could do it." The conditions also seemed to also work to Cal's advantage today. "They're a very good tailwind crew, and I do think that in a tailwind they are better than they would be in heavier conditions. All the times we've done in a tailwind have been very very fast." A final bit of inspiration, Teti said, came from Cal Women's coxswain Jill Costello, whose battle with lung cancer has touched just about all of rowing in the San Francisco Bay area. "I told the crew, somewhere in the last 750 meters, just give me 15 strokes for Jill," said Teti. Washington was devastated in silver medal position, a contrast to a truly jubilant Cornell crew in bronze medal position. "The guys handled the conditions well, we put a good surge in the race for that, but California was just better today," said UW head coach Mike Callahan after the racing. "Today's result is going to make people very hungry, there's no question we're going to be motivated by this." The Cornell V8 had a tremendous regatta, racing in a strong heat, taking their lumps in the rep, then sneaking into the final in third behind Harvard and Brown, before putting down their best piece in the Grand today. Cornell coach Todd Kennett relished his crew's performance today. "There are only three returners from last year in there, they average 178 pounds, and maybe 6'1". They're a tough bunch of kids, all year we were saying, what can we do, what can we make better? Today they did the job, it was really exciting." One coach quipped to Kennett as he was leaving the awards dock, "Todd, I thought you were done coaching lightweights!" In the Varsity Eight Grand final, fully three of the finalist crews (Cornell, Brown and Syracuse) took the detour through the reps, perhaps an indication of competitive the V8 field was this year, across the board. For equipment (and sportsmanship) purists, some folks noted that Cal was rowing a hull they got on loan from Stanford's Varsity Men. The Princeton men's lightweight eight also finished their season in the best possible way, holding on to a slim lead through the last 500m as Harvard, Navy and Yale all pressed them, to repeat as national champs in the event. "We were admittedly still a little bit clunky in our racing at Sprints, so we worked on that a lot these last three weeks," said Princeton coach Marty Crotty. "They'd done a lot of very fast time trials, so we knew that we had a shot." Navy claimed silver with a stellar row from an outside lane, while Harvard, who'd pushed the tempo fiercely midrace, had to settle for bronze. 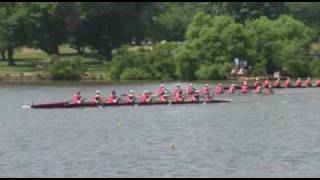 Yale, Georgetown, Dartmouth and Penn finished behind the medallists in this 7-boat final. The Stanford Lightweight women scored a sizeable upset in capturing the national championship today, putting a length between themselves and a heavily favored Wisconsin crew. "The standard is pretty obvious," said a happy and exhausted Stanford coach Al Acosta after the race. "What Wisconsin has done, and done to us for a long time, it's pretty clear where the bar is. I think we were really fortunate to get clobbered [by Wisconsin] in our first race of the year; that's kind of what the year was all about, coming back from that." Acosta also pointed to the trust in each other that the crew had developed over the season as a keystone to their success. "They proved to each other that they deserved each other's trust over the course of the season. Our final in this event last year was a disaster, and once they'd figured out this year that everyone was ready to do it, they became much closer." Looking towards the future, the Stanford crew has one Junior, the rest are Freshmen and Sophomores. The crew also bettered the course record today, beating the old mark by a second. The Wisconsin rowers and coaches were gracious in accepting their silvers; it's never easy when streaks this long end. Princeton claimed bronze in this event, with Radcliffe, Bucknell and Georgetown rounding out the final. The Men's JV race also came down, how else could it be, to a ferocious, perfectly executed sprint by the UW JV, which took them past Brown about 4-5 strokes before the finish line and to a one-seat win. "That event was incredibly competitive," said UW's Callahan. "The guys were really excited about the race, they said that they had an answer for Brown at the very end of the race." Both Washington and Brown torched the existing course record today, with both crews over 4 seconds ahead of the old mark. 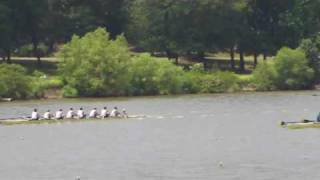 The Harvard JV, just 5th at the Eastern Sprints a few weeks ago, made dramatic improvements between then and today, and claimed bronze. In truly dominant fashion, the UW Huskies won the Freshman 8+ here today, keeping their nerves as an absurdly competitive race developed behind them for silver and bronze. This race may have been the Huskies sternest test all year, but they cleared this hurdle as well. "Actually it was not too much of a problem keeping these guys motivated," said Washington frosh coach Luke McGee. "We have a couple of walk-ons in the boat, and those guys bring a spark of excitement to everything we do, since everything is new for them. They haven't done six-lane racing, the national championship is new for them, so keeping them on point was never too much of a challenge." Cal claimed silver, and the Princeton frosh claimed a well-earned bronze ahead of Harvard, Cornell and Stanford. After a one-year absence, Washington reclaimed the Varsity Four today with a fairly untroubled row from the front of the field; the true battle was for silver and bronze, with Georgetown, who sneaked into this final by virtue of their 7/100s margin over GW in the semi yesterday, seizing their opportunity and sprinting through Wisco and [Cal] for the silver medal. Wisconsin took the bronze. "We're just trying to have as much fun as we possibly can," said UW coach Ben Fletcher. "Just row hard when you have an opportunity, and everything worked out great." Cornell took the Open Four today with a fairly classic V4+ lineup; stern pair were 3V guys and the bow pair came from the 2F; both of those boats had won Sprints for Cornell, so you have to figure that any combination of guys from those two crews would probably do alright here. "In practice a few times we had splits that made us wonder if maybe our speedcoach wasn't calibrated right," said Cornell coach Drew Tennant. "You never expect to win, but we knew we had a strong crew and would be in the hunt for the medals. We told them to make sure they committed to the whole piece, not get arrogant or lazy at any point." In addition to winning the race, the Cornell crew also bettered the existing regatta record in their event by one second. Wisconsin took silver in this race, followed by Washington in the Bronze medal position. The Loyola women's lightweight four ran the full gamut of "we're just happy to be here" to "yay, we won!" in their two days of racing here at the IRA; after a solid row in the heats yesterday, the crew put themselves in control early and then held off challenges from Wisconsin and Bucknell to capture gold in the regatta's only non-championship event. "Only after the reps were rowed did we allow ourselves to hope," said Loyola coach Al Ramirez after the race. "The quality of our opponents was never taken lightly, the girls were very intimidated lining up against those other crews, actually. We prepared the crews by telling them, all year, that if they worked hard, they might get the chance to line up against some of the best crews in the country." The crew's composition was apparently in doubt right until the eve of the regatta, as two members of the boat had been scheduled to be in Thailand as of a few weeks ago; the riots in Bangkok delayed that trip for several weeks, to the obvious benefit of the crew today. "Honestly, all four of those girls were our [openweight] varsity eight this year," added Ramirez. "We only had 12 varsity women all year, so we hope this will encourage more lightweight women to stay with us in future years." Perhaps fittingly, coach Ramirez handed off his coaches gold medal to the crew's spare on the awards dock. The University of Washington claimed the Ten Eyck trophy, which is awarded to the squad amassing the most points in the Varsity, JV and Freshman eights. "I'm really proud of the whole team," said UW's Callahan after the regatta. "Top to bottom I think we showed our depth and our speed, for Washington that's a lot of it, I think for a lot of people back home that's the most important thing. I think we did great in all of our events today." Princeton claimed the trophy for most improved performance by a team from the previous year, just ahead of Cornell. Once again, the racing today began with the Masters Eights; these are mixtures of younger alums and truly ancient mariners, with racing beginning from a staggered start from oldest average age to youngest. For the first time in as long as I can remember, MIT did not have the oldest Masters Eight in attendance; the MIT crew looked considerably more youthful than it has in recent years. The Masters crews row in equipment borrowed from their alma maters, which can almost inevitably lead to boat issues; we observed one of the Penn alumni boats struggle to get their coxbox working on the water, before the elder statesman coxswain bellowed "OK, we're switching to manual!" down the boat in a voice that many younger coxswains would envy. As we close down the regatta site, the water on the Cooper is whitecapping down the course; truly a fast day at the IRA. We hope you have enjoyed row2k's coverage of the collegiate championships this season, it has truly been our pleasure bringing it to you. I think Cal actually bought the boat from Stanford. It was too big for the Stanford crew and Cal picked it up from the Stanford boathouse a week or two before the regatta. Excellent coverage! I really enjoyed reading the coverage articles each day. They were very well written. I have one question: Is it standard practice to borrow a shell from another school (like you said CAL did when it borrowed a shell from Stanford for the Men's Varsity Eight finals today) and then rename it? I noticed in the pictures the yellow shell was clearly marked "Bob Berry '61". Bob was a standout on CAL's IRA championship teams in 1960 and 1961. It's been awhile since I participated in the IRA, and I have no recollection of anything like that being done.